"Growing up happens in a heartbeat. One day you're in diapers; the next day you're gone. 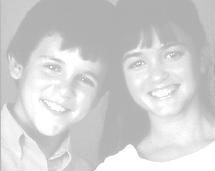 But the memories of childhood stay with you for the long haul"
The official Danica McKellar website is here! and even watch some clips. It's a great site-- you should check it out! The Wonder Years on DVD coming out? click here and enter your e-mail address there at right. how many customers are waiting for this title. Hello, all the Wonder Years fans! I finally moved this page to usa.her.jp. because sfc server account would be expired in Spring of 2009. I know I have not updated this page for a long time and this page looks very out-of-dated. I am sorry about that. I, however, does not have time as much as I used to, so I decided to just move almost everything and hope you can find something interesting. Your comments and info are welcome, but please don't feel bad even if I can't reply them or add them to this page. Thanks for your understanding. I hope today will be a part of your WONDER YEARS. This is not an official site, but the first WY fan site launched in 1995. Copyright 1988-1993 New World Entertainment Ltd.